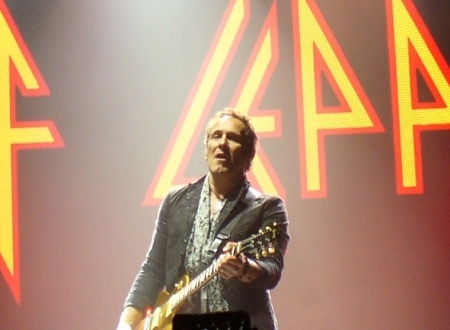 Def Leppard guitarist Vivian Campbell was recently interviewed by Edmonton radio and commented on the 2018 tour. Vivian spoke to Jake Taylor of Classic Rock K97 radio in Edmonton, AB, Canada to promote the upcoming tour with Tesla. Vivian talked about the Rock And Roll Hall Of Fame Induction/2018 tour, ticket sales/stadium shows, 2019 Canadian Tour, touring with Tesla, 2019 live show, getting better as a live band, advice to younger self and Last In Line's new album. He commented on the RRHOF Induction and the band's 2018 world tour. "Oh that old thing. Thank you. I know who would have thought you know?. Yeah I mean that kind of like, that put the cherry on top of what was a great 2018 for Def Leppard. You know we had a really really busy year. Bunch of sold out shows. Bunch if kids coming to see us old men and now we get that you know as a Christmas present. So yeah it was great. We're very flattered." "We did a million tickets in North America yes on our co-headline tour with Journey. And we even played a bunch of the iconic baseball stadiums like Wrigley Field and Fenway and Coors Field and sold them out. So it was great you know and like I said earlier I mean, we've noticed for years but especially last year in '18 on that tour. You know a large large percentage of the audience now are young enough to be our children. So we're not just playing to our own generation any more." "And with that youthful influx comes more energy from the audience and we really feed off of that. So in turn we give more you know. And our show goes up and energy level. So it's a good thing you know." "Yes we've always enjoyed playing in Canada. Historically it's been a great country for us to play and in fact going back to the 80s, when people actually bought a lot of records, Canada has always been Def Leppard's strongest market per capita when it comes to record sales. So we always make a point to get there whenever possible." "You know we frequently play Toronto and Vancouver and Montreal on occasion. But you know it's nice to actually get to do a more comprehensive tour and get to places like Edmonton and Calgary and Winnipeg and Hamilton and whatever you know. Just get out there and spread a little love." "You know we always try and make it bigger and better every time we do it, you know, Def Leppard's always trying to reinvent the wheel. You know we always put back into our show and think how can we make it more spectacular than it was last time and the energy level. You know the music itself is very high energy so the show has to reflect that. So you know we throw all the bells and whistles in. Everything but the kitchen sink. Maybe even the kitchen sink I don't know." "We have a big staging, just the biggest most high definition video wall you can imagine. The content on the videos is bespoke to us, to the songs and we change that up from tour to tour. And mostly just our performance you know." "We actually get better as a band. You know Phil and I we talk about this constantly. We come off stage and we compare notes and stuff and you know maybe we're crazy and maybe it's just us that kinda notices because it's a subtle change. But from year to year, from tour to tour we get stronger at what we do you know. And that's one of the great things about being a musician as opposed to say an athlete where you have this finite window of time when you're on top of your gig." "As a musician you get to get better you know. Like we get better as singers, as players you know. I feel much much more confident and more comfortable as a guitar played than I've ever felt. I think I'm playing absolutely better than I've ever done in my life. And I think the band is playing better than we've ever done, you know, we're just buoyed by this resurgence that's been around the band in recent years." "Like I say the million tickets sold in 2018 and then getting the Hall Of Fame nomination you know. It was just, it's just been a spectacular ride."